"Dressed To Kill", the new video from Swedish hard rock band NIVA, can be seen below. The clip was directed by Patric Ullaeus of Revolver Film Company, who has previously worked with DIMMU BORGIR, LACUNA COIL, IN FLAMES, AMARANTHE and KAMELOT, among others. 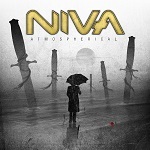 "Dressed To Kill" is taken from NIVA's new album, Atmospherical, which will be released on October 28. In the realms of melodic metal, Sweden's Lion's Share has been synonymous with class and quality for over two decades. Not least thanks to a succession of great vocalists: Andy Engberg (220 Volt, Sorcerer, Section A), Nils Patrik Johansson (Astral Doors, Wuthering Heights, Civil War et al)... and who else? Oh yes – Tony Niva, the vocal powerhouse from Lion's Share's seminal fourth album Entrance (2001). What's his story? – I've been focusing on my career in the IT business, so I didn't make much music between 1994 and 2011, says Tony. But after that second NIVA album, I made two more: Magnitude in 2013 and Incremental IV in 2014. And after that, I thought I might as well release what I recorded in 1995 as the intended follow-up to No Capitulation: Relievin' Rain (2015). Now, however, I'm back with a whole new incarnation of NIVA. On this new album, I wanted to broaden my horizons. Different production, a heavier sound. So I've been working with Lars Chriss, my old pal from the Lion's Share days. Lars Chriss, now a highly renowned producer/mixer with the likes of Overland, Chris Ousey, Radioactive "F4our", Seven and Lugnet on his resumé, has lent his producing, song-writing and guitar-playing skills to NIVA's sixth outing, Atmospherical. Don't let the title fool you – NIVA has definitely moved away from the AOR-ish, comparative softness on previous works. Obviously. Besides Lars and Tony himself, former Lion's Share luminaries Kay Backlund (keyboards) and monster bassist Andy Loos (also of Glory, Seven, Covered Call fame – to name but a few) have also lent their considerable skills to the creation of Atmospherical. The album even includes a stellar remake of Lion's Share 1988 debut single b-side, ”I'm On A Roll”. So the Lion's Share reminiscence is very much intentional. And quite welcome.